Home DIY Projects	Powder Room Makeover? Greetings, Friends! Welcome to wonderful Wednesday! We are still in full unpacking and purging mode. I’m too embarrassed to show you our garage, storage area and pretty much the rest of the new house because not one single area is finished! Yet in the midst of all of this, we are actually contemplating a powder room makeover. Are we crazy? Our new house is lovely. We appreciate all of the high end materials and the thought and care that went into each and every aspect of this home. We’ve welcomed the change in style and decor and tried to fit our furniture and decorations into the new space. But, just a few things are so unique and different I don’t think we can make it work. For instance, the powder room. It has a Moroccan/African feel that really doesn’t fit our style. Here is how the powder room looked when we purchased the home. The flooring is a pebble and grout tile we believe. And all of the materials in the powder room are very high end. The vessel sink is beautiful, as are the faucet and handles Vessel Sinks for purchase. They have gold accents which we love and plan to incorporate into the new design. 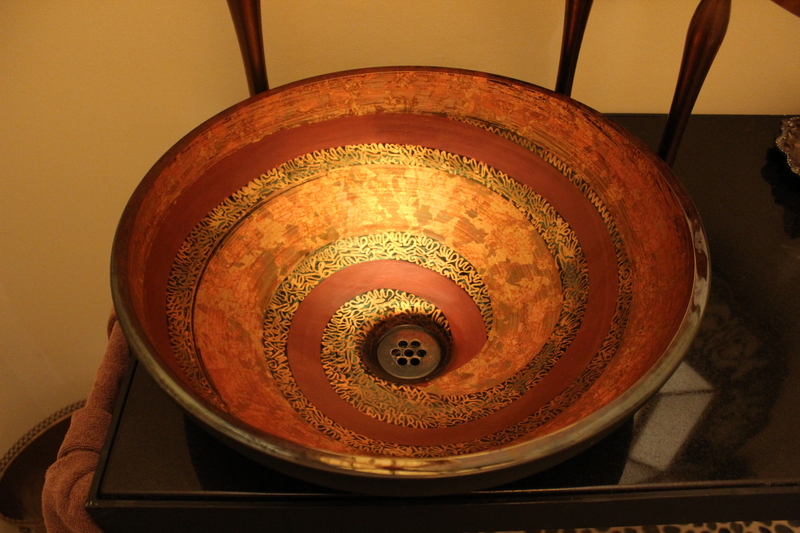 The vessel sink has swirls of copper, gold and black and a hint of green. It’s so unique and pretty we hate not to use it in our design even though it is not your typical French Country style. There is nothing that is functionally wrong with the bathroom as it is and the materials are quite nice. But we could really use some storage and I’m personally not a fan of exposed pipes and plumbing. Can there be a happy medium? We think so. This is an inspiration piece I found on Pinterest. I love the modern look of the faucet and vessel sink married to the antique gold mirror and the vintage chest. And of course a few crystals never hurt anyone. This is another beautiful bathroom via French Country Cottage. (I’ve had this one pinned forever!) Again, I admire the vessel sinks and raised faucets softened by the gorgeous mirror and sconces and softer tones.